Secure POP/SMTP/IMAP/SyncML mail server. Webmail client & BlackBerry push email. ...... push email delivery from the mail server to their favorite BlackBerry device. 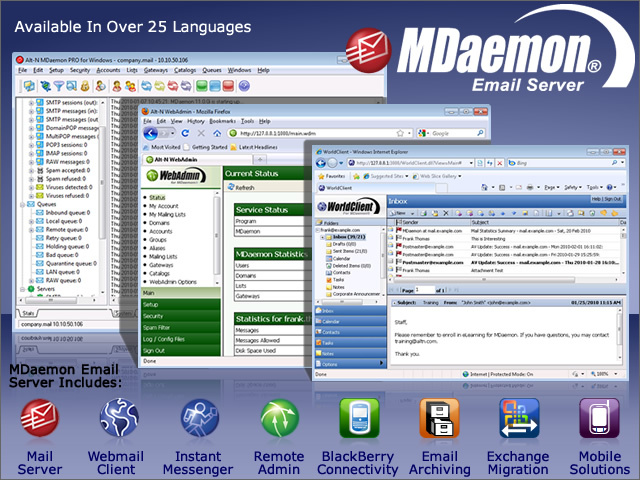 Additional enhancements have been made to MDaemon's multi-language WorldClient webmail server that includes message follow-up flags, summary views, enhanced search, and enhanced layout features. With its robust feature set, simple administration, and low total cost of ownership, customers that want the control of an on-premise mail server, without the complexity and costs offered by other mail servers, continue to choose MDaemon. Qweas is providing links to MDaemon Email Server for Windows 11.0.3 as a courtesy, and makes no representations regarding MDaemon Email Server for Windows or any other applications or any information related thereto. Any questions, complaints or claims regarding this application MDaemon Email Server for Windows 11.0.3 must be directed to the appropriate software vendor. You may click the publisher link of MDaemon Email Server for Windows on the top of this page to get more details about the vendor.